Start your tour from the harbor up to the Railway Station Square, right next to one of the most beautiful Romantic buildings in Helsinki, the National Theater. From there, continue your tour through central Helsinki to get a feel for its vibrant streets, mostly built in the late 19th and early 20th centuries. Then, follow the main shopping street, Aleksanterinkatu, towards the city's main square, Senate Square. At the central point of the square is the magnificent Helsinki Cathedral, built in 1852 when Finland was part of the Russian Empire. Stop at the nearby seat of the Finnish Government and the main building of Helsinki University. Continue on towards the Katajanokka Peninsula, stopping at the Uspenskii Cathedral, a beautiful Orthodox cathedral atop a hill. Go up the hill and to the terrace of the cathedral for a stunning view over Helsinki. Explore Market Square (Kauppatori), where you can find souvenirs and taste local specialties. 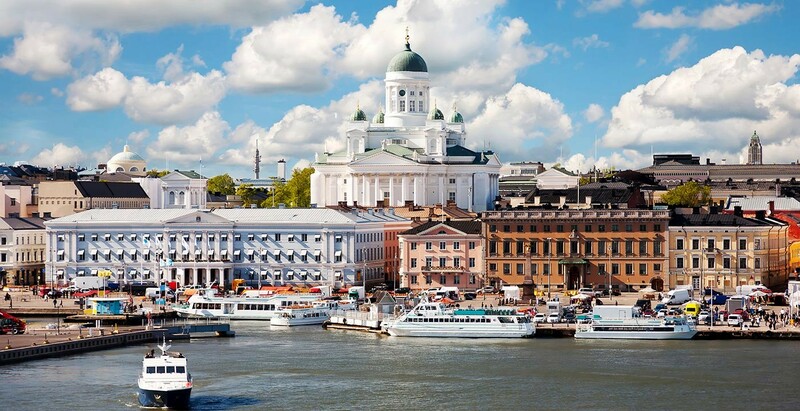 Once back on the mainland, walk along the Esplanade Park and Helsinki’s main street, Mannerheimintie, before stopping by the parliament building, National Museum, and Finlandia Hall, a concert and congress hall designed by famous Finnish architect Alvar Aalto. After a walk through the district of Töölö, visit the Temppeliaukio Church, which stands at the top of a rocky hill, and a monument dedicated to the most famous Finnish composer, Jean Sibelius. End the tour at the city center to enjoy the shopping and dining.